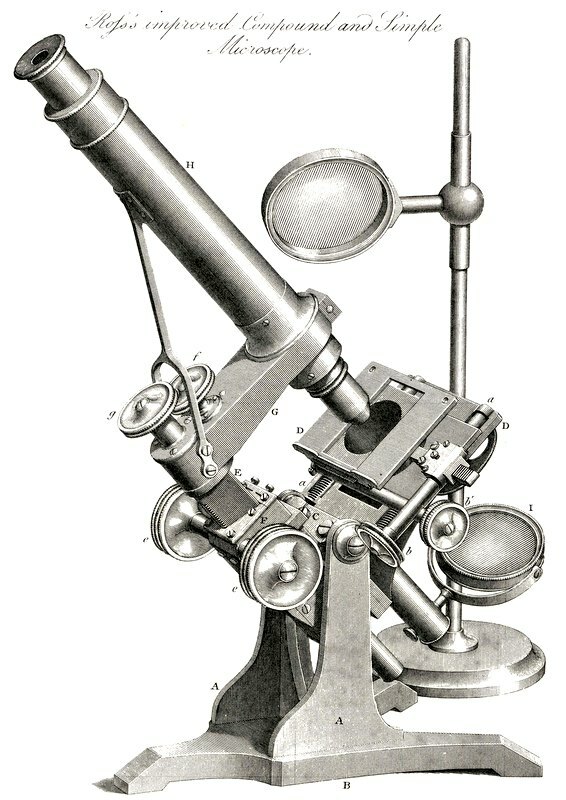 Quekett provides an authoritative history of the microscope from ancient times to the perfection of the achromatic lens… This book is a classic of the mid-19th century and a model for contemporary text design. In the Preface, he acknowledges the importance of the microscope as an instrument second only to the telescope. He also expresses the need for a generalized book of instruction applicable to any instrument. Finally, he attributes the extensive sections on microscopical specimen preparation to his own experience and expertise. The book opens with a 46-page history of the microscope that perhaps is one of the most accurate and detailed ever written. An excellent review of ancient literature traces the history of the magnifying lens, or burning lens, from Aristophanes in 500 B.C. to Seneca in A.D. 65, Pling in A.D. 79, Ptolemy in A.D. 100, then on to Bacon in 1551, Fontana in 1618, and Drebbel in 1621. Quekett then moves on to the celebrated Robert Hooke in 1667, discussing the work presented in Micrographia. He then weaves an accurate and well-written history of the development of the microscope through the next 150 years. The author's valuable and lucid chronology for the solution to chromatic distortion in the objective lens systems of the compound microscope is a classic. He relates that this problem was first described by Chester More Hall of Essex in 1729. In 1747, Euler experimented and produced an achromatic object glass. In England, Dollond was stimulated by the work of Isaac Newton on color dispersion of white light to do experiments that produced color corrected telescopes but not microscopes. Chevalier, in France, reported on a 1774 article from St. Petersburg that provided detailed instruction to form an object glass of three elements the first and third of crown glass and the second of flint. Further, Quekett relates that in 1812, Sir David Brewster rendered both simple and compound instruments achromatic by the use of an immersion oil bridge between the objective front lens element and the specimen being examined, and at about the same time, Professor Amici of Modina was experimenting to improve the image. His work passed on to Goring and Cuthbert, who improved upon his design by producing a reflector-based achromatic microscope. Finally, Quekett reports that in 1829, Joseph Jackson Lister Esq. read his paper to the Royal Society in which he described the method of making the most improved achromatic objective lens systems. This book then describes a number of microscopes and instruments using beautiful woodcut illustrations. Detailed descriptions of the rationale and function for each instrument are also provided. Part two of this treatise provides detailed instructions on the use of the microscope. Quekett explains how to create optimum illustration with carious lenses, substance conditions, and lamp relationships. He then provides various methods for preparing specimens for microscopic examination. This book is a classic of the mid-19th century and a model for contemporary text design.